I’m excited to bring you today’s recipe as part of the Ultimate Recipe Challenge. This challenge is where a group of bloggers is challenged to come up with a recipe using a specific ingredient. 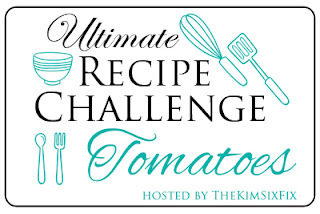 This month, the challenge ingredient happened to be TOMATOES! My contribution to the challenge this month, is this SUPER EASY Crock Pot Chili with beef and ranch style beans. Topped with a little cheddar cheese or sour cream, this Slow Cooker Chili will be a huge hit for the whole family. Seriously, aside from browning the ground beef, it is not much more than dumping ingredients into a crock pot and opening it a few hours later to pure deliciousness! Using the slow cooker allows for the flavors to really meld and the tomato juice in lieu of water gives it a rich full tomato flavor, perfect for this challenge ingredient. A quick and hearty beef and bean chili with a touch of heat thanks to the addition of RoTel tomatoes and ranch style beans. A perfect chili dog chili!